addressing diabetes symptoms, maintaining normal glucose levels, and reducing the risk of long-term complications. Let me give you the good news first: Diabetes does not have to control your life. You can control it! This new report that is yours—free—tells you how you can take command of your diabetes, simplify blood sugar management, and make the most of today’s breakthroughs in treatment. When it comes to diabetes, you are the most important person involved in your treatment. That is why University Health News is offering you this important new report, Diabetes Symptoms and Treatments: How to lower blood sugar with a diabetic diet, medications, and lifestyle changes absolutely free right now. The Report will alert you to diabetes symptoms. It will brief you on advances in screening. And it will share key self-help treatment strategies that will enable you to live healthier today and free from complications in the years ahead. You’ll learn about a diabetic diet that is both delicious and easy to prepare. You’ll read about the most effective medications. And you’ll discover three sensible lifestyle changes that can delay and even prevent diabetes. The report has a singular purpose: to give you the skills and tools to manage your diabetes with greater confidence and, most important, with greater success. Diabetes Symptoms and Treatments is yours free. And you can download it now! You are smart to want to know about diabetes symptoms. Diabetes now affects more than 29 million Americans and as many as 86 million more Americans have prediabetes symptoms and are at risk for developing type 2 diabetes unless they take steps to regain normal glucose levels. The signs of diabetes, especially type 2 diabetes, are often undetected in the early stages of the disease. That is why the American Diabetes Association now recommends that every adult over 45 have their blood glucose level tested every three years. What are the diabetes symptoms in men? What are the diabetes symptoms in women? Do they differ? Diabetes Symptoms and Treatments will tell you. The report will alert you to eight symptoms common to all forms of diabetes, plus one very ‘visible’ symptom of type 2 that you may not have know about. Diabetes is a group of diseases in which the body is unable to properly utilize blood sugar (glucose) for energy. There are three primary forms—type 1, type 2, and gestational diabetes—and in each case, the body is unable to move the glucose into the body’s cells where it is needed. Type 1 diabetes, formerly known as juvenile diabetes, affects only 5 percent of diabetics. In type 1, the body doesn’t produce enough insulin, the hormone that helps glucose enter the body’s cells. Type 2 diabetes represents 90 to 95 percent of all cases of diabetes in adults. In type 2, the cells of the body have some resistance to the effects of insulin, causing normal glucose levels to be elevated. The net result in all types of diabetes is that the body’s cells are deprived of their energy source. Unaddressed that can mean problems, quite literally, from head to toe. That’s why it is so important that you learn all you can about diabetes symptoms—and treatments. Download your copy of this vital University Health News report now. It’s yours free. What you need to know about diabetes screening: From diabetes symptoms to a diabetes diagnosis. As never before, your physician can construct an effective treatment regimen that speaks to your individual condition. The first step is diagnosis. Diabetes Symptoms and Treatments explains the risk factors your doctor will consider, today’s options in screening, and what test results mean. Discover table-turning treatments that are straight-forward and easier than you thought! Whether you have type 1, type 2, or gestational diabetes, the primary treatment goal is effective blood glucose management. Today, advances in medications—from rapid-acting inhaled insulin to once-daily glucose-lowering pills such as Januvia, Invokana and Farxiga—offer new, less-restricting options in drug therapy. Diabetes Symptoms and Treatments provides authoritative and objective analysis of over two dozen medications so, with your physician, you can select the best and safest options for yourself. You’ll read about the most prescribed oral medication for type 2 diabetes…a new closed-loop insulin delivery system…and a drug that lowers bad cholesterol—and blood glucose levels too! Meet the power of the diabetic diet! 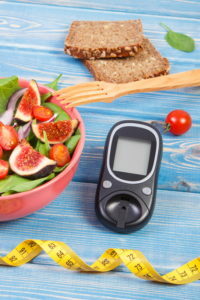 The diabetic diet is one of the most valuable lifestyle changes you can make, no matter what type of diabetes you have or for how long you’ve had it. The diabetic diet is much like the popular Mediterranean diet. Rich in fruits, vegetables, lean proteins, and whole grains, the diabetic diet not only improves glucose levels, but can help with weight loss. improve cholesterol levels, and reduce cardiac disease risk. The report will help you plan meals to meet your needs and please your family. You’ll be briefed on the benefits of low glycemic index eating… you’ll master carbohydrate counting…and you’ll get ideas for dishes to enjoy—healthfully and happily—again and again. You can stay well—and eat well. Download Diabetes Symptoms and Treatments now—absolutely free! Untreated diabetes has consequences—serious consequences. The complications arising from diabetes can steal your vision, limit your mobility, and rob you of your independence and even your life. Did you know diabetes is the leading cause of kidney failure…or that diabetic neuropathy is responsible for over 70,000 lower-limb amputations annually…or that hearing loss is twice as common in people with diabetes or that recent studies suggest a link between type 2 diabetes and Alzheimer’s disease? You’ll master the simple steps to avoid diabetes complications. With correct treatment and recommended lifestyle changes, you can prevent the onset of complications. That is why detection, diagnosis and treatment are so important. Your FREE report will bring you clear and instructive guidance for managing diabetes with greater assurance and knowledge. You’ll gain the ability to recognize the symptoms of diabetes as well as the first warning signs of a threatening complication. You’ll find hope and help for maintaining a healthy weight, for fitting exercise into your daily routine, and pinpointing the diabetes risk factors within your power to lessen and manage. The report will prepare you to address diabetic shock. You’ll be briefed on two diabetic crises characterized by hyperglycemia. You’ll learn when and why hypoglycemia is likely to occur. And you’ll find tips for educating friends and family on how to help in an emergency. Diabetes Symptoms and Treatments will inform, encourage, and most of all, empower you. Get your copy now. It’s yours absolutely free! P.S. To delay or prevent type 2 diabetes, you don’t need to lose as much weight or exercise as much as you might think. You’ll find the surprising numbers on page 30 of the free report. hace años me entere que tenia diabetes, he tratado de cuidarme con la comida.se que pueden haber medicamentos, pero escucho que tienen muchas contraindicaciones. Creo que ustedes tienen y manejan una informacion muy seria y responsable por lo que me gustaria recibier informacion respectiva.